Right off Grasslake Rd. kinda across from Port of Blarney? @CobraSki03 you want me to yank yer yacht out? So I officially will not be returning to SL. I put a deposit down at another marina to keep my trailer and boat. This flooding is BS, I spend to much $$ to not be able to use trailer due to flooding. Thanks for looking out though. do you have a rebel now? what marina you goin' to? No that is my cousins truck, we were out looking at marinas to relocate trailer to. Yes you can, I dont have the attachment piece that goes on motor, it it was an emergency I could have made something work out. I was told power would be restored by wknd. That is my cousins Checkmate a few slips down from me that is selling..
i have the attachment if you're feelin' froggy. i don't mind. yea, Grass Lake Marina will be the new home. Got a nice spot down by the water and our boats will be right across from us. 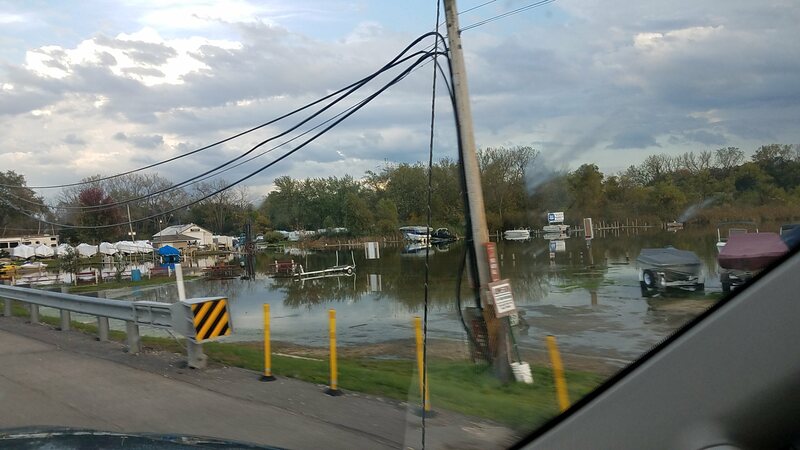 With this flood, and its the worst one this season, it was a great time to see which marinas flood. Grass Lake was dry, and with floating piers that was even a bonus. Hopefully will have trailer moved in the next two weeks. Right now I would fear the trailer sinking in the grass trying to pull it from the spot. or my truck. whateva... we have our ways. id get it out. Now this would be a MILLER LITE moment in history!! that's messed up, they shouldn't be doing that... it's no wake on the chain and closed on the river. furthermore, she's wrong actually, you can 100% get ticketed blowing no wake areas that aren't marked because it's out of season. and with all the facebook chain keyboard warriors i would not risk it. See that’s what I thought. it is doable for me to get there plenty well. chain should technically be closed right now even. I was thinking after todays rain it would be. I pulled the PQ out Friday because I had a shrink swap appointment Monday. Saturday I was helping my neighbor pull his toon and decided to pull my toon out also since I had his help. The river was at a point where I would either need to take off the Bimini top or disconnect the canvas top on the lift to get the boat out. I said fucked it. Good think I removed it, the river CLOSED Sunday morning. Current was moving also, fastest I have removed a boat during. I was gonna keep in the toon in till the end of the month but not with this flood. Probably take a few weeks for the river to get back to normal, it gets dark at 430PM now, and the next two weekends I am busy. Talking with neighbors this is the 4th time this season water has come into my yard and over my lower pier section. They all said it has never been like this. I'm kinda over it.